By Bizodisha Bureau, Bhubaneswar, February 5, 2019: Odisha Chief Minister Naveen Patnaik on Tuesday launched a frontal attack on the Modi government at the Centre over alleged negligence of backward areas of the state amidst disruption by Congress activists tried to disrupt his rally, demanding jobs for local youths. Addressing a public meeting in Nabarangpur, Patnaik said, “We will not allow the derailment of development works in the KBK region. The state government has launched Biju KBK Yojana for providing basic facilities to the people of the region”. Patnaik’s meeting comes a day ahead of Congress President Rahul Gandhi’s visit to adjacent Kalahandi district. Gandhi is set to address a public meeting on Wednesday at Bhawanipatna, the district headquarters of Kalahandi. Over 100 activists of the grand old party were detained by the police Tuesday as they tried to enter the rally venue, seeking jobs for local youths, police said. Kalahandi-Bolangir-Koraput (KBK) region, spread across southern and western regions of Odisha, is among the most backward areas in the country. 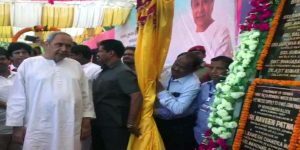 The CM inaugurated several development projects in Koraput and Nabarangpur districts and tom-tomed his government’s achievements in the less-developed areas. Attacking the BJP-led NDA government, the CM said the KBK region has been “neglected by the Centre”. Patnaik also asserted that his government has been working for the poor, empowering women and taking every measure to strengthen the farmers of the state. He criticized the central government for reducing scholarship allotment for SC students. Patnaik’s visit to the region is considered politically significant as people in the KBK region has mostly stood with the Congress since the time of Indira Gandhi. The CM inaugurated projects worth Rs 1,155 crore and laid foundation for development works worth Rs 1,846 crore in the two districts. In Nabarangpur, he inaugurated projects worth Rs 19 crore and laid foundation of new works worth Rs 1,197 crore. In Koraput, Patnaik launched the much-awaited Telangiri Irrigation Project (TIP), constructed at a budget of Rs 992.85 crore. The project is expected to provide irrigate of Jeypore and Borigumma blocks of Koraput. “The TIP will strengthen the economy of the farmers of the region,” Patnaik said. In all, he dedicated projects worth Rs 1,136.4 crore to the people of Koraput and laid foundation of new works worth Rs 749 crore. The chief minister also attended a youth conclave organised by the Biju Yuva Bahini (BYB) at Jeypore. Thousands of BYB activists from Koraput, Rayagada, Nabarangpur and Malkangiri districts attended the programme.